Remember that beautiful cookbook I featured a few months ago, Delicious Probiotic Drinks by Julia Mueller of The Roasted Root? 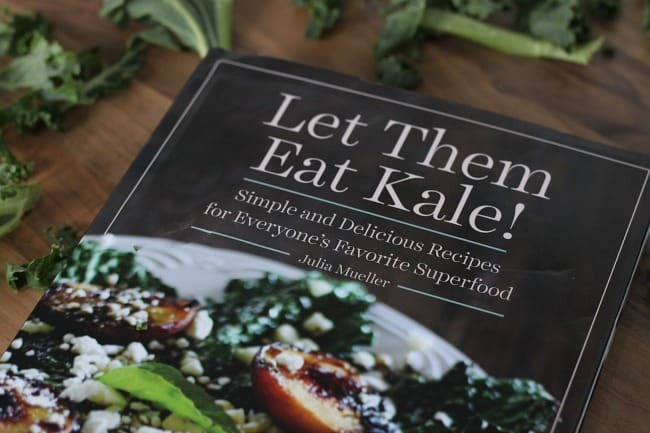 Well, the lovely Julia has only gone and done it again, with her new book, Let Them Eat Kale! Which is pretty much the best cookbook title ever, by the way. I’m already envisioning a whole series of books titled with kale-based puns (I’m thinking ‘Have Your Kale and Eat It’ will be next, perhaps followed by ‘That Takes The Kale’ and maybe ‘I Love You Like a Fat Kid Loves Kale’). Anyway, since I love you guys so much, and Julia loves you all too, we thought it was only fair that we let one of you take home your very own copy! And she’s even generously allowing me to share one of the recipes from the book for you today. Here’s a small confession: this was the first time I’d ever cooked with kale (I know, scandalous). It’s pretty much the trendiest superfood there is these days, but it seems to be less prevalent in the UK than in the US, so it’s just not something I’ve ever thought to try. Let’s be honest, superfoods aren’t always the tastiest thing on the planet. But, considering the fact that kale is absolutely packed (and I mean packed) with vitamins K, A and C, along with many, many other good things, I welcomed the opportunity to give it a go. There were a million recipes in Let Them Eat Kale! 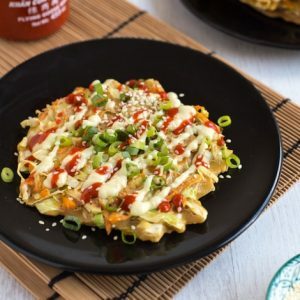 that I was seriously tempted to feature today: savoury cheesy kale pancakes; superfood breakfast tacos; southwest stuffed bell peppers; zucchini, kale and leek fritters; BBQ black bean, kale and sweet potato burgers… I literally created shopping list after shopping list because I kept finding something I wanted even more and started over again. 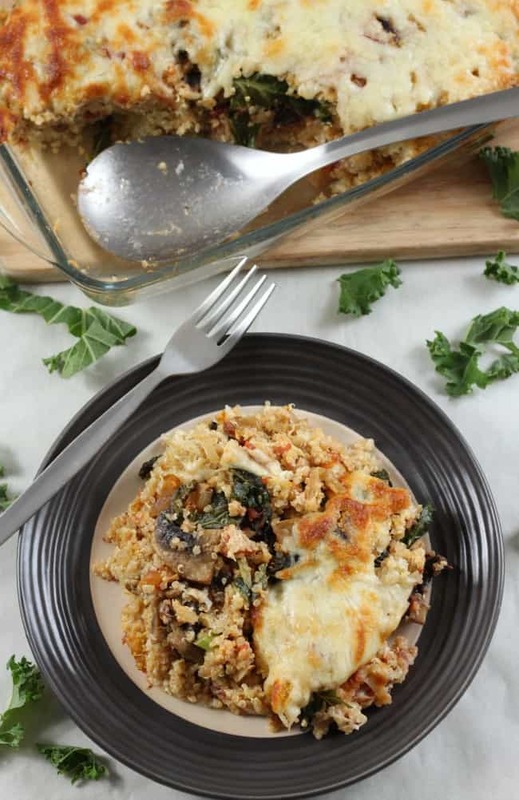 Eventually (eeeeeveeeentually), I settled on this creamy portobello and kale quinoa bake – because what better way to introduce myself to kale than with a recipe that contains ricotta, cream, parmesan and mozzarella? 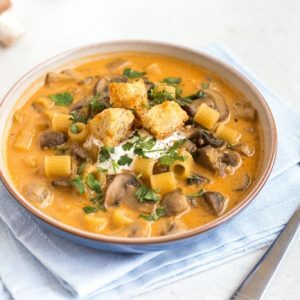 Despite how it might sound, this dish isn’t overwhelmingly rich – there are plenty of vegetables, as well as juicy chopped tomatoes, to stop it being entirely dairy. It ends up beautifully creamy, but still tasting nutritious. I did make a few small changes to the recipe – since kale is less popular in the UK, I couldn’t get my hands on the dino kale that Julia recommends, so I used curly kale instead, which worked just fine. I also adapted it to the British format, since that’s the way we do things round here – if you’d like the American format, you’ll just have to buy the book (or try and win one below!). So, who’d like a copy of this awesome cookbook? 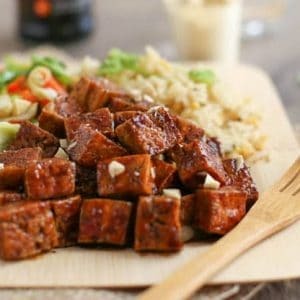 It’s not 100% vegetarian, but there are a lot of veggie recipes in here – in my opinion, way more than you’d find in most cookbooks. 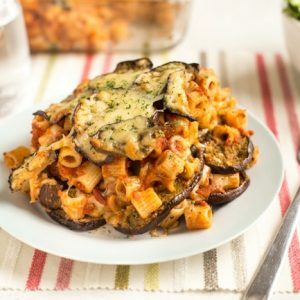 And of course, even the meaty recipes can be adapted to be vegetarian if you wish! 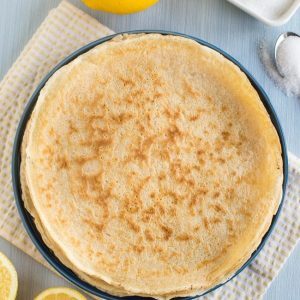 All of the recipes are also gluten-free! Just use the Rafflecopter widget below to enter for your chance to win a copy. Open worldwide! Boil the quinoa in a pan of water, according to the instructions on the packet (around 15 minutes). The quinoa is cooked when it is soft and the spiral-shaped germ has detached. Drain off any excess water. Meanwhile, heat the olive oil in a large pan, and add the onion. Cook for a few minutes over a medium heat, and then add the garlic and portobellos. Cook for a further 5 minutes, until the mushrooms are soft. Add the thyme and chopped tomatoes, and bring to a gentle simmer. Leave to cook until any excess liquid has evaporated - around 15 minutes. Add the kale, and cook for a further 5 minutes until it has wilted fully. When the quinoa is cooked, add the cream, ricotta and parmesan, along with plenty of seasoning. Mix well until the cheese has melted. Combine the quinoa mixture with the vegetable mixture, and mix well. 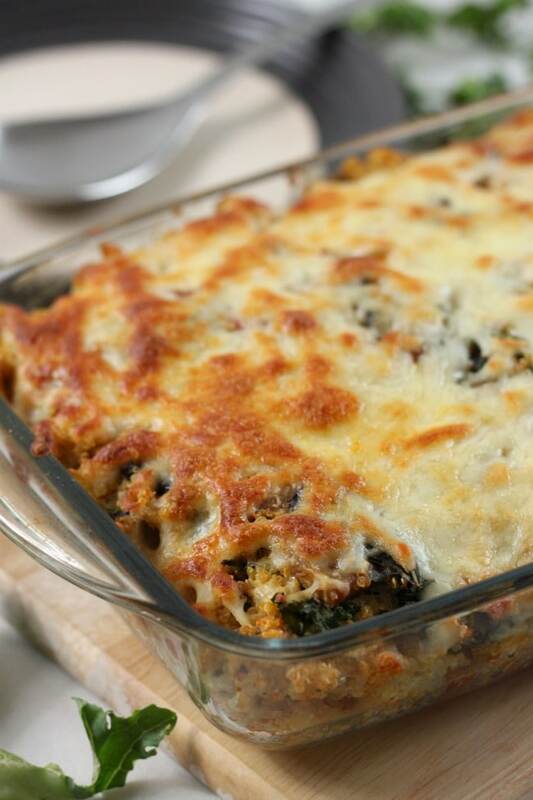 Transfer to a large casserole dish, and top with the grated cheese. Bake for around 15 minutes, until the cheese is crispy. 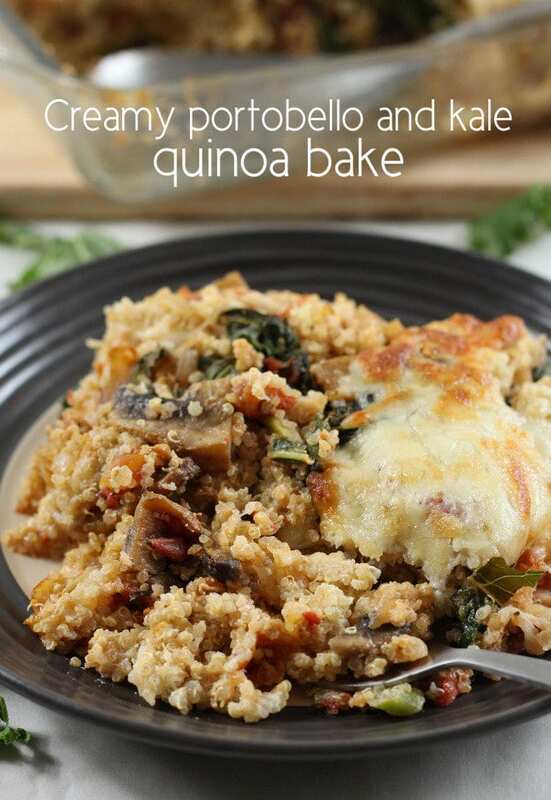 This will definitely be my next quinoa recipe to try, looks amazing! what wonderful photos. I’m having a bit of a mushroom fest at the moment! Nice dish Becca! 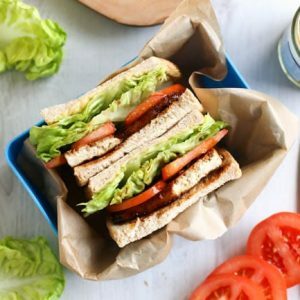 I’ll go add your giveaway to The Food Blog Diary. 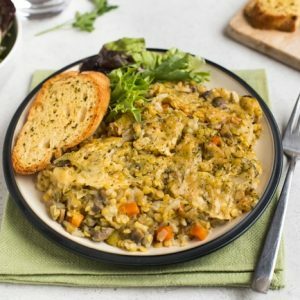 You’ve inspired me to try my hand at making a quinoa bake! I have all the stuff (plus a HUGE bag of kale I bought for who knows what reason) and I’ve been meaning to amp up my kale/quinoa game. Thank you! 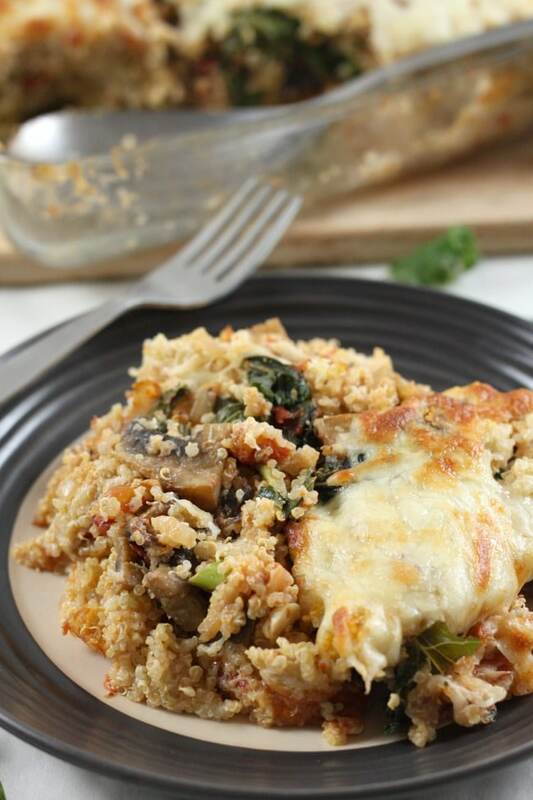 I’ve cooked with kale but never baked quinoa – bookmarked as a family mid week meal that we’ll all enjoy. That way we can have our kale and eat it…. boom boom. Sign me up, I’ve had that book on my wishlist since I heard about it! I’m trying this over the weekend! 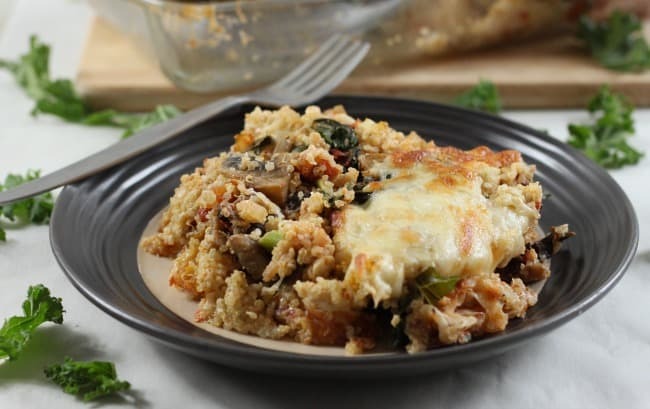 Never had quinoa or kale before, but what better way to try them than with cheese and mushrooms? And it’s delicious! Two converts to kale and quinoa over here! Great name for a cook book! I’ve only really cooked with kale one, I put it in a veggie lasagne. 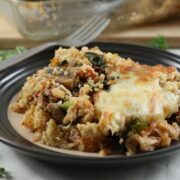 But as I’m feeding a newborn I need plenty of iron and protein so this is a great recipe for me! Thanks for sharing. You’re right, it’s probably not easy to buy kale. We grow it, so I’ve never had to look. It’s a wonderful veg but I didn’t know it was any better for you than cabbage. I’m always looking for new cookbooks to add to my collection. Thanks for sharing! 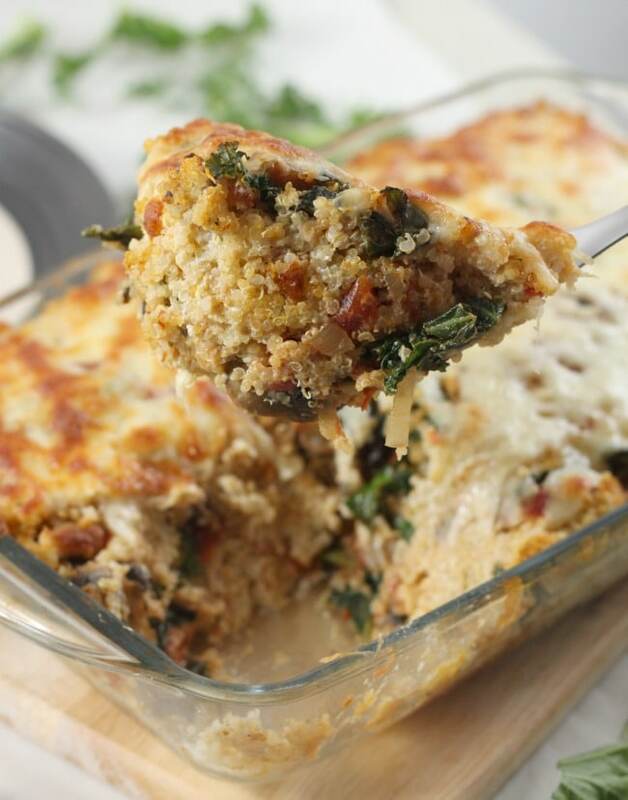 Such a beautiful and hearty recipe with simple ingredients. I’m substituting spinach with kale since we don’t get that here. Tasty Veg dishes are hard to find. Defnitely going tomake this. Looks gourmet too! Oh that does look good! I am a kale addict, always have a bag in the fridge. I am always puzzled when 90% of Kale in the UK comes shredded in bags and not in a bunch like in the states? Julia is a wizard, her recipes are so good! And this one was no exception :) good luck! Thank you so much for reviewing my cookbook and for your sweet words! I’m so happy you like it and am glad you’ve now been formally introduced to kale! !